Linen is a fantastic summer fabric. Cool and crisp, it breathes and keeps you comfy through the hottest days. These new lightweight shirtings are a linen and cotton blend, the best of both worlds! Treadlette Jennifer loves handwork and embellishment. Here are a couple of her latest little gorgeous things. It's not a headband, it's a bookmark! And probably the cutest one around. Look at those little sheep! This embroidered and beaded brooch is so pretty and sparkly! The Material Girls have a whole new Summer Sewing Series, multiple classes to help you put together some fun wardrobe basics and have a great time, too! The first class in the Summer Sewing Series is the Marcy Tilton Jacket. Using Vogue 9244, you'll make a versatile lightweight jacket, perfect for Minnesota summers, unpredictable weather, and moving in and out of air-conditioned spaces. Cool pockets, a casual hood, and shaped hemline make this jacket unique and fun. Your fabric choice can transform this pattern from just a little cover up to a stand alone “upscale sweatshirt." The class will cover techniques for sewing with knits on your regular sewing machine, but we recommend having some experience sewing with knits. Serger construction will also be covered, so if you have a serger and love it, bright it along! To sign up for this class, call us at (651)698-9690, or stop by the store! To see all of our classes, check our class page here! Check out the new arrivals in our organic section: buttery soft 100% organic cotton knits! 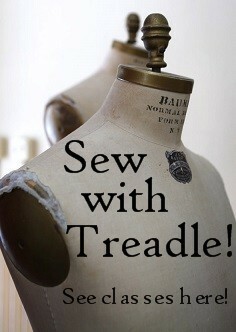 Treadle will be open regular store hours Saturday and Sunday May 27 & 28, and closed Memorial Day. We have some adorable new bug prints, just in time for summer. Don't worry, these crawlies are definitely not creepy! We're starting a new series here on the blog! Classes in Depth will tell you more about some of the unique opportunities offered in our Treadle classroom. Our class page tells you the basic info, but Classes in Depth aims to give you a little more, so your questions can be answered and you can figure out just which classes are right for you! 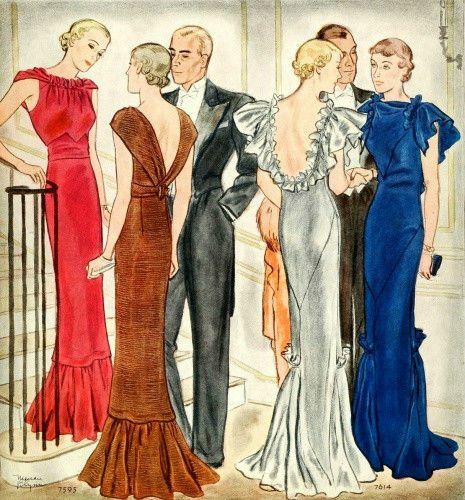 I'm starting out with one of my favorite classes to teach, History of Fashion! 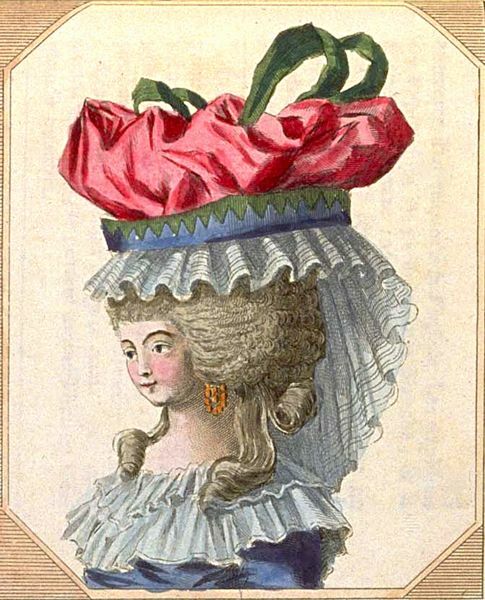 In this 2.5 hour lecture and discussion, I will cover a 400-year timeline of fashion history, including lots of pretty pictures! We'll focus on women's wear but trends in menswear styles will also be covered. 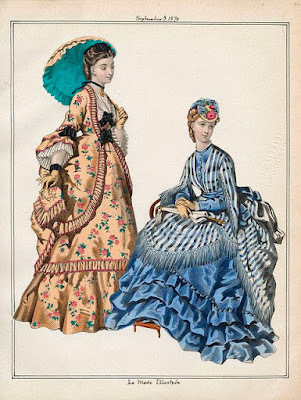 I hope to address many common questions about historic clothing. Why so much underwear? Were corsets uncomfortable? How do you get your hairdo that big? We'll also talk about the why of fashion, and what inspired change. If you're interested in re-creating historic garments, this is perfect starter class. I will give you tips on how to begin and lots of resources for learning more. If you like vintage details and want to incorporate them into your modern sewing, we'll cover that too! There are plenty of ways to be inspired by the past. To register, call us at (651)698-9690 or stop by the store. Look for more Classes in Depth posts coming up on our blog! It's wedding season, and that means more than just bridal gowns! Attending weddings and being part of the bridal party requires something special to wear, too. Treadlette Rebecca has put together some fabulous style ideas for anyone who is "not your average Mother of The Bride (or Groom!)." This gorgeous grey lace with a grey and gold shot silk shantung and Burda 6646. Charcoal grey lace with teal and bronze shot silk taffeta, also with Burda 6646. This bright orange silk chiffon is paired with an earthy printed silk and Vogue 1532. A dramatic printed and cut velvet with deep red taffeta create a sheath dress and wrap ensemble using Simplicity 8258 (Rebecca notes, "it has awesome pockets!") and Vogue 8957. We have a gorgeous new group of cotton sateen fabrics! These luscious 100% cotton sateens have a matte shine and a slightly heavier weight, making them ideal for pants, skirts, and jackets. We have some interesting new cottons with abstract map and aerial view designs. Perfect for your modern quilting! Are you ready for summer fun? Our new Summer Class Schedule is now available! You'll find plenty of your favorites, like Continuing On and Basic Sergery, plus lots of exciting new classes! Come for the Summer Sewing series with the Material Girls and make some stylish wardrobe essentials. Make a super-fast quilt with Melissa! Copy your favorite ready-to-wear garment with Michele! You'll find everything from fitting and special techniques to great summer clothes to quilting and crafts, and it's all available here! More gorgeous new fabrics from Art Gallery! These prints are all on soft, woven cotton lawn. This last one is a drapey rayon challis. Michelle has been at Treadle for about 4 years, making her one of our newest Treadlettes! Like many of us, she started sewing in Home Ec in the 8th grade. "My Home Ec teacher used her brassiere as a pincushion (when she didn't have the pins in her mouth). In her class we made a drawstring gym bag and then I made a 'hot-pant' suit out of tie-dyed denim! I was hooked!" 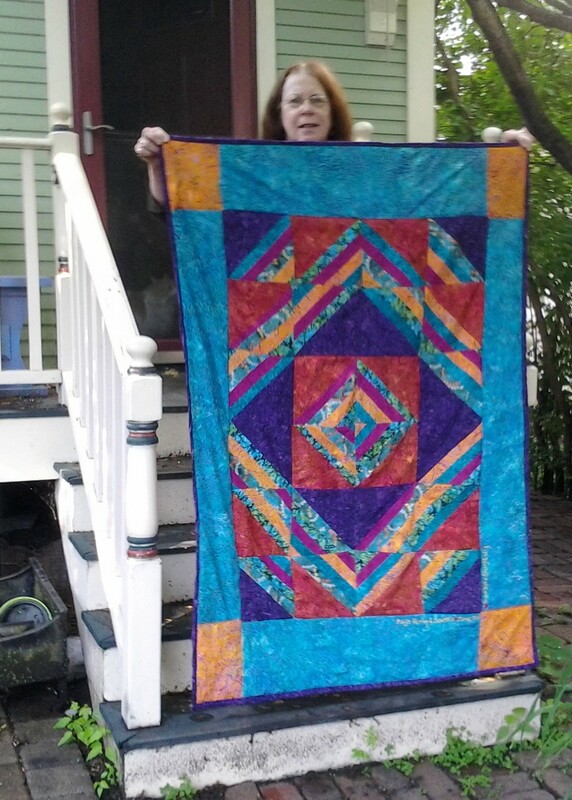 She kept sewing for years, learning on her own. "I made prom dresses, shirts, skirts etc. when I wanted something new to wear." Michelle loves sewing detailed clothing for children. "I prefer to sew with natural fibers but I'm branching-out and learning new techniques with other fabrics. "One of my favorite projects is a smocked pinafore made using a dotted Swiss cotton I purchased at Treadle. This garment went on to win a prize at the Minnesota State Fair." Here's one of Michelle's latest smocked creations. Her detailed handwork is just breathtaking! We have a couple of modern pretty cotton lawns from designer Joel Dewberry! Perfect for spring! We love these new geometric-print cotton broadcloth and lawn fabrics. They are from the Print Making line by designer Lizzie House. We still haven't completely finished our Get To Know Us series; there are a lot of us Treadlettes! Today Sherry is giving us a look into her sewing story. "I started hand-sewing at my grandma's knee when I was about three, making clothes for my teddy bear. Grandma was infinitely patient with my early attempts. Machine-sewing came later, when I was about twelve. My mom was a fabulous sewist and made all three of her daughters' clothes through our childhood and high school (this was back before cheap imported clothing was available, so sewing in those days was a way to save money). She was also a perfectionist, so I didn't really sew a lot until I went to college and could stretch out on my own and experiment. Mom was a classic tailor; I was more a 'guerrilla sewist,' at least in my early years. "I've been shopping at Treadle for decades but started working here about 10 years ago. One day I was shopping in the store and Roberta mentioned she needed someone for Wednesday evening shifts. She asked if I'd like to do it; I said yes. It was the shortest job interview I've ever had. "I sew most of my clothes---I'm short and full-figured, and nothing really fits except what I make for myself. I especially love historic costuming and making baby quilts (I've probably made close to a hundred over the last thirty years, for babies, and now grandbabies, of my friends and relatives). "I play music at many historic sites in the region with my band Dunquin and I make period-appropriate clothing in Regency, Civil War, and other eras, for myself and my band. After many years, it feels like clothing and not costumes to dress the part, and it's very satisfying to be someone else for a weekend. "My favorite project is often my latest project. I finished a baby quilt in bright, tropical colors a few weeks ago, using the brilliant batiks in the Treadle's collection, and it's one of the most fun things I've made. "To all sewists out there, especially beginners: Making your own clothes and other creative projects is fun, satisfying , and gives you a great sense of accomplishment, especially knowing nobody else is ever going to have your unique garment or fashion sense! Even if it's a bit daunting at first, it gets easier and more fun the more you sew. And you're in the great Sisterhood of Sewists, one of the best groups ever!" Lightweight silk suitings like these are all about Spring! Our selection of silk matka, tussah, and noil will add texture to all your favorite jacket and pants patterns.